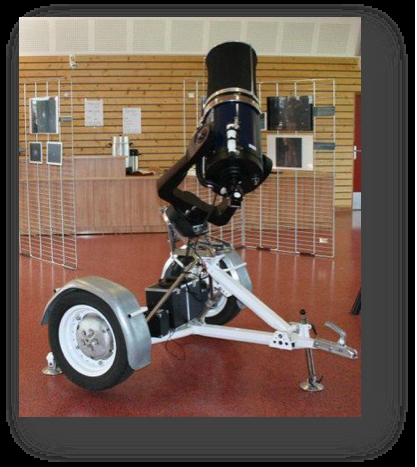 AAAP members were elated when the club took possession of its new “Observatory on Wheels”, a 12-inch Meade LX200 ACF mounted on an airdampened Peugeot trailer. Affectionately dubbed “The Cannon” by Saul Moroz who conceived the project, the observatory will allow members to do serious observing anywhere. “We’re ready for the Winter Star Party now!” said Saul. The observatory is available for use by any member after they attend wheelholder training with Gene Ramsey. Anyone wishing to use the Cannon should contact Ludy or email the secretary of the club. This entry was posted in April 2013, Sidereal Times and tagged cannon, ludy, secretary, wheels. Bookmark the permalink.